On April 25th, an interesting group came together for a biodiesel bus tour of best habitat and energy practices in Raleigh faith communities. The tour was organized by my Youth Faith Conservation Network, a Toyota TogetherGreen project. If you are interested in specific activities or results from the trip, I recommend my other reflection, which also details the usefulness of this type of tour for awareness raising and agenda setting among particular stakeholders. This reflection can be accessed here. In this post, I will share a brief personal account of the tour. The tour built on the synergy which exists in Raleigh, NC between Audubon’s Bird Friendly Communities initiative and faith communities. Kim Brand of Audubon NC provided a larger context for this partnership and mutual affinity in her post about her work at the state level (here). The tour was a way to galvanize this overlapping network into action within our particular faith community settings in Raleigh and Durham, NC. Our small group of 12 was large, including representatives from Audubon, North Carolina Interfaith Power and Light, Greenway Transit, and the Youth Faith Conservation Network as well as congregants from at least five faith communities and affiliates of the Nicholas School of the Environment at Duke University (2 students, 2 alumni). The tour group, pictured below, had a feeling of extended family. In this group, each has contributed in their own way to furthering environmental work within faith community settings. Their backgrounds and prior work in this area has been impressive. I will only provide a few examples. 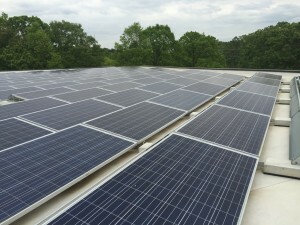 Gary and Jane Smith have been key actors in recently successfully fundraising for a 10kW solar-electric system at their congregation, Community United Church of Christ. Carl and Emilie Siegel have been critical leaders for North Carolina Interfaith Power and Light and the Interfaith Food Shuttle. Owen Clapp has created a raised beds for a children’s addition to the community garden as well as a post and beam fence. Owen is a high school student who is a member of the Youth Faith Conservation Network. This is not even mentioning the other presenters which spoke to our group but did not join us in the tour’s entirety. They are each incredible assets. The tour assembled this group to not only encounter best practices in habitat and energy as they currently exist in faith community settings but to encounter one another. The result was a productive dialectical engagement between person-to-best practice and person-to-person. 1 & 2: The youth faith conservation network is planning two bird gardens at faith communities represented by tour participants. 3: One congregation is developing a solar fundraising campaign, as informed by Community United Church of Christ’s effort. It seems quite helpful to be able to focus our intentions with concrete examples, such as the Brown-headed Nuthatch Boxes. Edward Landi, a member of the Youth Faith Conservation Network who was unable to attend and is not pictured, is leading our initiative to install 50 of these bird houses and monitor them. This tour was able to distribute three. The Brown-headed Nuthatch Nesting Box Campaign seems to be quite helpful as an entry point for faith communities developing habitat initiatives. 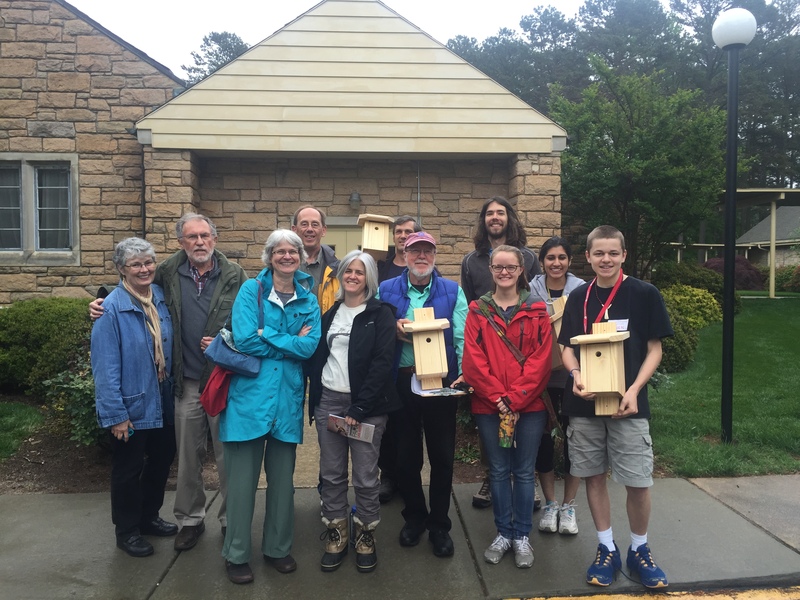 The tour visited three faith communities, two of which had Brown-headed Nuthatch boxes and all three had some kind of bird house. 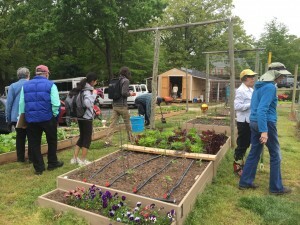 Other touchstone best practices – which the tour would not be complete without – are solar panels installation and community garden creation as an outreach strategy. 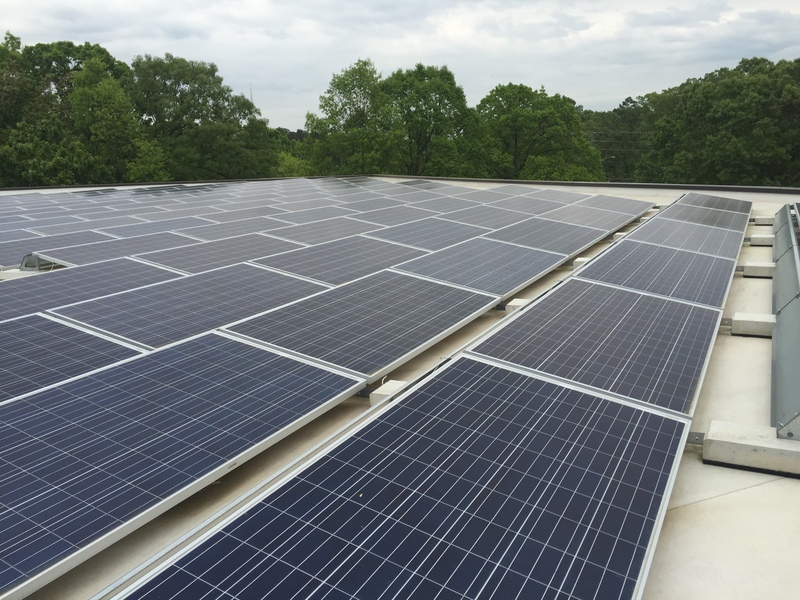 We visited the largest solar panel array on a church in Raleigh- a 47 kW system at Highland United Methodist Church, pictured below. This array provided an opportunity to discuss financing mechanisms for solar, which was quite helpful given the different strategy employed by a congregation represented within the tour group. Highland United Methodist also has a large community garden which has been quite successful in inspiring other gardens, they can count more than 60 transplant gardens. We strolled through this garden and got to discuss with a wide variety of both members and area residents who help in the garden. Environmental work is often not the first priority in faith community settings. However, these initiatives are growing ground and energy and provide compelling examples of communities working together to improve the environmental consequences of their common and personal lives. Faith communities are dispersed widely and one cannot venture too far into a place where humans eat, sleep, or recreate without encountering a house of worship. The incorporation of these sacred spaces within Audubon’s Bird Friendly Communities initiative seems natural and promising. I am personally thankful that these groups are recognizing their common ground. This tour has been a great success for engaging likely (and critical) stakeholders to the topics of habitat and energy in faith communities. However, there are many more important voices to be heard and partnerships to create. I welcome feedback on this tour and any potential collaborations to come. Providing a bridge between the academic study of ecology and theology and communities of faith so that students, practitioners, and people of faith increasingly recognize shared ground and opportunities for contributing to the common good of the environment.